The UK government promised 1.6 bln pounds to help poor English towns. It looks like a ploy by PM Theresa May to get her EU withdrawal deal through parliament. But it pales next to aid from Brussels and the investment lost since the country voted to leave Europe. 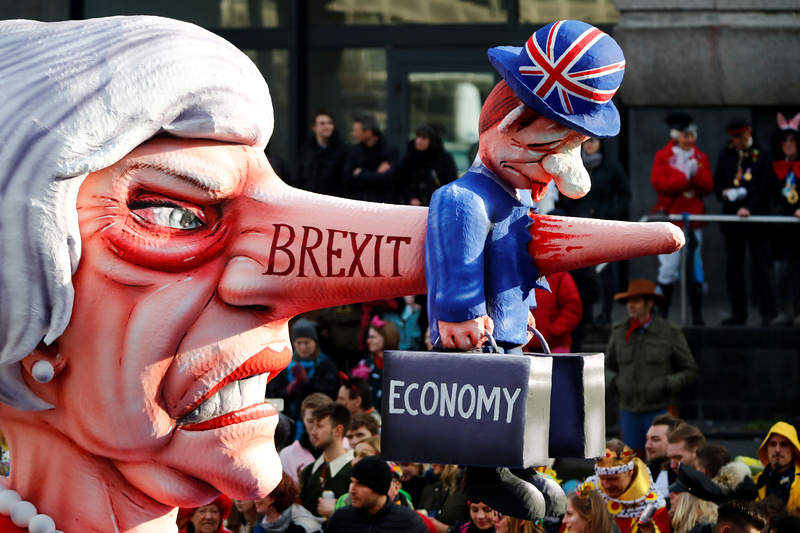 A figure depicting Britain's Prime Minister Theresa May is pictured during the "Rosenmontag" (Rose Monday) parade in Dusseldorf, Germany March 4, 2019. British Prime Minister Theresa May on March 4 unveiled plans for a 1.6 billion pound fund to boost economic growth and employment in impoverished parts of England, especially the North. Britain is due to leave the European Union at the end of this month and May, whose exit deal with Brussels was rejected by a large majority of lawmakers in January, has promised parliament will get to vote on a revised deal by March 12. John Mann, a lawmaker for the opposition Labour party, said in January that he was in talks with civil servants on a potential investment fund for leave-voting areas, and that such a fund would persuade other Labour parliamentarians to back May’s deal. Communities Secretary James Brokenshire said on March 4 that the money was not linked to support for the withdrawal agreement.